1. The 25-35HP wheeled tractor is offered with 3/4-cylinder engine. The vigorous power makes for stable operation. Moreover, the low energy consumption is conducive to environmental protection. 2. Reliable and durable, the transmission system of our agricultural machinery is produced based on the technology from Europe. The gear position is 8F+4R. Additionally, 8F+8R and 16F+8R are optional. 3. For stronger load bearing capacity, the front drive axle of the four wheel drive tractor is offered with integrated axle housing. 4. The 25-35HP wheeled tractor uses dual clutch, double speed PTO shaft, and two hydraulic outlets. So, application in conjunction with more implements is realized. 5. 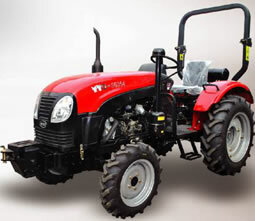 Designed with suspended clutch, brake control system, main and auxiliary side mounted gear shift level, the four wheel tractor is well received by virtue of comfortable driving and convenient operation. 6. The hydraulic steering system can be manually controlled. 7. To avoid the accident caused by mal-operation, there is safety startup control device offered for the product. 8. Our eco-friendly tractor has passed E-Mark certification. 9. The infinitely variable control rear wheel is optional.